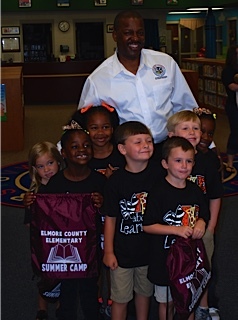 WETUMPKA, Ala. & BIRMINGHAM, Ala. - June 17, 2016 - PRLog -- PROMOTING SUMMER READING…Elmore County Schools, Alabama is promoting summer reading with all of their elementary summer camp students. Relaxed schedules and the absence of structured education can lead to what is known as the "summer slide." Summer slide is the tendency for students to lose some of the achievement gains they made during the previous school year. Research has shown that students can lose up to 2 months of learning during summer. "We can stop that by having our kids continue their learning with engaging books that will help them avoid the summer reading slump. 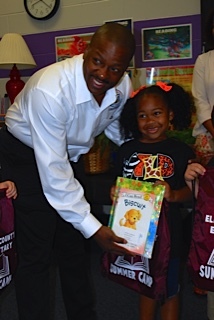 Furthermore, this allows each child to deepen their love of reading with books they can keep and expand their home libraries," said Dr. Andre' Harrison, Superintendent of Elmore County Schools. Mrs. Claire Moore, Interim Assistant Superintendent for Elementary Education, explained, "The books were carefully selected by the elementary education department to ensure they met the grade level expectations as well as provided the type of reading we want to see our kids doing. We feel strongly about the opportunity to continue reading throughout the summer and allowing our kids to build a love for reading. Each book will have a home resource to support parents while children are reading the books over the summer." Booksource supported Elmore County Schools in building out their customized list of books for each grade and developing the home resources to support parents. "At Booksource, we believe it is crucial to foster engaged reading throughout the entire year. That's why we work closely with school systems like Elmore County to ensure that we get the kinds of books and resources into the hands of students that will make them want to read all year long," according to Neil Jaffe, Chief Strategy Officer for Booksource. 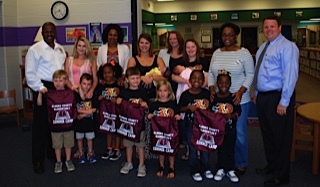 BBB Educational Enterprises, Inc., an Alabama local education company, provided the support to Elmore County Schools in developing a summer reading initiative for elementary students. "We are passionate about the work we need to do in literacy. The 'summer slump' is a real concern, and through the leadership of Dr. Harrison and Elmore County Schools, students will be better prepared for success in the upcoming academic year through meaningful and engaging summer reading," said Brian Rhodes, President BBB Educational Enterprises, Inc. Elmore County Schools are making a difference in the education of their students even after the bell rings for the summer.